Night Trap is a tough game to review because it is objectively terrible and one of the worst games ever made. It is an important part of gaming history, though, and also has an undeniable charm to it where you can have a good time with it even know it’s awful. 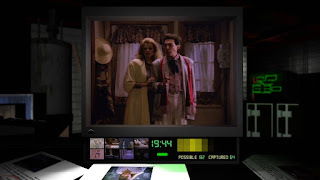 As long as you know going in what to expect, Night Trap is fun as a sort of novelty historical piece. If you’re interested in seeing what the fuss has been about regarding Night Trap for all of these years publisher / developer Screaming Villains really went the extra mile for the Night Trap 25th Anniversary Edition release as this is the best looking, best playing, and most feature-packed version of the game. See our full PS4 Night Trap 25th Anniversary Edition review for all of the details. Night Trap is a full-motion-video game originally developed for release on the ill-fated Hasbro Control-Vision system in 1989. That system never actually came out, but Night Trap was eventually released in 1992 for the SEGA CD and has re-released a handful of times on other platforms since. The game is probably mostly remembered as being at the center of U.S. Senate committee hearings on violent videogames in 1993, which led to the creation of the ESRB videogame content ratings system that is still used today. The fact that Night Trap led to the ESRB is one of the strangest / funniest things in videogame history because it is actually extremely tame by today’s standards. So tame, in fact, that it was re-rated as “T” for Teen instead of the “M” for Mature rating it originally received. Playing the game makes it pretty obvious that the Senators who used Night Trap as the poster child for videogame violence and sexual content didn’t actually ever play it and likely never even saw it beyond cherry picked snippets that weren’t really representative of the game. The story in Night Trap has you playing as a member of Sega Control Attack Team (yes, that’s S.C.A.T.) that is investigating the disappearance of five teenage girls at the Martin estate. It turns out that the house is full of closed circuit TV cameras and remote controlled traps, so S.C.A.T. takes control of the system as another group of girls, including an undercover agent, spends the night in the house. Your job is to protect the girls from hordes of invading creeps called Augers who are actually vampires and want to capture the girls for their blood. 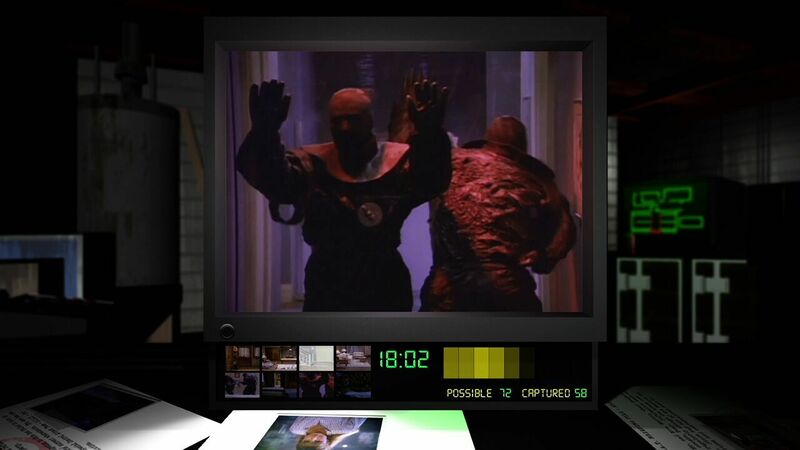 The actual gameplay in Night Trap consists of switching between eight camera feeds and activating traps when you see an Auger in the room. A little onscreen indicator flashes when you can activate the trap, so the game consists entirely of switching cameras until you see a bad guy, waiting until the light flashes, and then pressing a button to trap them. The traps have a color-coded security system, for some reason (to make it more videogame-y, I guess), so you also have to swap color codes once in a while in order for the traps to work. Of course, Night Trap isn’t simply about catching the Augers as there are also a bunch of teenage girls running around the house that you can watch through the CCTV feeds. Watching the girls is how you get the actual story of the game as well as how you know when to swap color codes – because someone will literally say “We need to change the code to (color) now”. The problem with Night Trap, however, is that it is impossible to pay attention to both the Augers and story at the same time. If you watch the story, the house fills with Augers and everyone dies. If you focus just on the Augers, you don’t get any of the story. But you have to focus on the Augers because they appear somewhere in the house pretty much constantly. Playing the game “properly” relies entirely on trial and error as you memorize the locations of the Augers on subsequent playthroughs. It, uh, isn’t especially fun. Thankfully, the whole game is only about 30-minutes long when you do everything right, so your suffering doesn’t last especially long. It only takes an hour or so total before you're figured everything out and "finished" it. The 25th Anniversary Edition does make things a little easier in some key ways. In the older versions of the game the camera feeds were represented by static icons but in the 25th Anniversary Edition the camera feeds are actually little video thumbnails so you can see when an Auger is in a room and switch to it instead of just guessing. This makes the game significantly easier. Another nice touch is that you unlock a movie of all of the story scenes once you beat the game so you can actually watch the goofy, schlocky, cheesy, terrible 80’s story without having to worry about Augers. The 25th Anniversary Edition has some other neat features, too. In addition to the new interface mentioned above, you can also opt to use the interfaces from previous versions of the game and it is interesting to see how the game has evolved over the years. It also has to be noted that the video quality is surprisingly good here as the developers were able to use the original master footage – including some never before released scenes - and didn’t have to compress the hell out of it like in every other release. It doesn’t look great, mind you, but it isn’t terrible potato quality like every other version of Night Trap. Other features include an interview with co-creator James Riley and the Night Trap prototype game Scene of the Crime. You can also play a survival mode where you just fight waves of Augers until you get overwhelmed. As a game, Night Trap is a pretty terrible overall experience because it is just poorly designed. As a piece of history, however, and as a novelty you play knowing full well it is going to be awful, Night Trap is worth playing. The 25th Anniversary Edition is also surprisingly fully featured with extra modes and easily the best presentation the game has ever had. It isn’t great – in fact, it’s pretty bad – but Night Trap 25th Anniversary Edition is still worth a look purely for the nostalgia and history around it. Plus the fact it is easily playable and accessible now on PS4 (and soon on Xbox One) for $15 doesn’t hurt. If you’re even the slightest bit curious, buy it.